1. 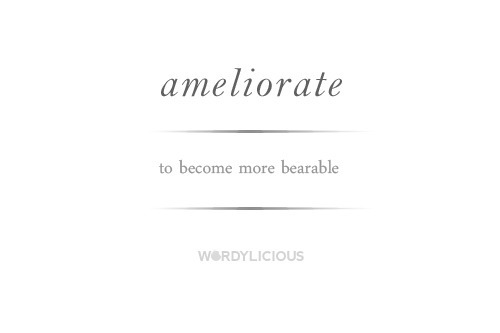 The definition of ameliorate – it is the process that happens when two substances merge to the same temperature or level of moisture – it becomes more bearable. My husband tried to assure me that this process would happen in the icy cold pool in our back yard in the middle of the night. My nice warm body would warm up the ice water he’d convinced me to plunge into and we would both come to a happy medium…he couldn’t have been more wrong…I do NOT ameliorate with unheated pools. 3. Scooby Doo has a laugh track. I never watched this cartoon as a kid and neither did my kids but it happened to be on in the optometrist’s office and it was annoying me and I couldn’t figure out why until I focused on it. Every time there was a funny line a laugh track played…who puts laugh tracks in cartoons? 4. Nice’N’Easy is the home hair dye for me. I have tried to be a DIY hair-dyer on several occasions and it has never worked. My hair looked exactly the same as it did before…but not this time, it worked, covered my gray silver hairs and got me back to being blonde! Not to worry hairdresser friends I will probably still come to see you now and then! 5. The mountains are HOT! We don’t usually travel to the mountains in summer but we were heading to a wedding (one my husband was performing) and I thought it would be cool up there as opposed to our hot prairie weather. NOT!! While the prairies were balmy but reasonable we were cooking in mid-30s. So not pleasant. On the upside, I had to buy a new outfit because I didn’t pack enough clothes! Thank you Mark’s Work Wearhouse for helping me find something cute to wear to the gift-opening. Love this shirt. My smart husband picked it for me! 8. I learned about exhaust emission farming – I’m not even going to begin to try to explain that, but I learned a lot about it this month. 9. I learned that I could share something about myself that I thought was better left in a closet. When I did…it quit having power over me. You can read the whole series hear on the blog. It begins here (The Beginning of Grace).